The International Boundary and Water Commission (Spanish: Comisión Internacional de Límites y Aguas) is an international body created by the United States and Mexico in 1889 to apply the rules for determining the location of their international boundary when meandering rivers transferred tracts of land from one bank to the other, as established under the Convention of November 12, 1884. The organization was created as the International Boundary Commission by the Convention of 1889 between the United States and Mexico. It was given its present name under the 1944 Treaty relating to the Utilization of Waters of the Colorado and Tijuana Rivers and of the Rio Grande. Under these agreements, the IBWC has a U.S. section and a Mexican section, headquartered in the adjoining cities of El Paso, Texas, and Ciudad Juárez, Chihuahua. The U.S. section is administered by the Department of State; the Mexican part by the Secretariat of Foreign Relations. demarcation of the land boundary. The U.S. and Mexican commissioners meet at least weekly, alternating the place of meetings and are in almost daily contact with one another. Each section maintains its own engineering staff, a secretary and such legal advisers and other assistants as it deems necessary. The Treaty of Guadalupe Hidalgo of 2 February 1848 fixed the international boundary between El Paso – Ciudad Juárez and the Gulf of Mexico. The Gadsden Purchase Treaty of 30 December 1853 extended the southern boundary of New Mexico and Arizona southwards to enable the United States to construct a railroad to the west coast along a southern route and to resolve a question arising from the 1848 Treaty as to the location of the southern boundary of New Mexico. Temporary commissions were formed by these boundary treaties to perform the first joint mission of the governments of the United States and Mexico, which was to survey and demarcate the boundary on the ground in accordance with the treaties. Another temporary commission was created by the 1852 Boundary Convention (29 July), which surveyed and increased the number of monuments marking the land boundary westward from El Paso and Ciudad Juárez. As settlements sprang up along the boundary rivers and the adjoining lands began to be developed for agriculture in the late 19th century, questions arose as to the location of the boundary when the rivers changed their course and transferred tracts of land from one side of the river to the other. The two governments, under the 1884 Border Convention (12 November), adopted certain rules designed to deal with such questions. By the 1889 Border Convention (1 March), the two governments created the International Boundary Commission (IBC), to consist of a United States Section and a Mexican Section. The IBC was charged with the application of the rules of the 1884 Convention, for the settlement of questions arising as to the location of the boundary when the rivers changed their course. That Convention was modified by the Banco Convention of 20 March 1905 to retain the Rio Grande and the Colorado River as the boundary. The 1906 Boundary Waters Convention (21 May) provided for the distribution between the United States and Mexico of the waters of the Rio Grande above Fort Quitman, Texas, for the 143-km (89 mile) international boundary reach of the Rio Grande through the El Paso–Juárez Valley. This Convention allotted to Mexico 60,000 acre feet (74,000,000 m3) annually of the waters of the Rio Grande to be delivered in accordance with a monthly schedule at the headgate to Mexico's Acequia Madre just above Ciudad Juárez. 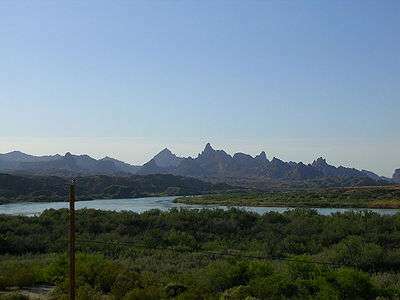 To facilitate such deliveries, the United States constructed, at its expense, the Elephant Butte Dike in its territory. The Convention includes the proviso that in case of extraordinary drought or serious accident to the irrigation system in the United States, the amount of water delivered to the Mexican Canal shall be diminished in the same proportion as the water delivered to lands under the irrigation system in the United States downstream of Elephant Butte Dike. In the 1933 Border Convention (1 February), the two governments agreed to jointly construct, operate and maintain, through the IBC, the Rio Grande Rectification Project, which straightened and stabilized the 249-km (155 mile) river boundary through the highly developed El Paso–Juárez Valley. The project further provided for the control of the river's floods through this Valley. Numerous parcels of land (174) were transferred between the two countries during the construction period, 1935 – 1938. At the end, each nation had ceded an equal area of land (2,560.5 acres (10.362 km2)) to the other. All of the waters reaching the main channel of the Rio Grande from the San Juan and Alamo Rivers, including the return flows from the lands irrigated from those two rivers. One-half of all other flows occurring in the main channel of the Rio Grande downstream from Fort Quitman. All of the waters reaching the main channel of the Rio Grande from the Pecos and Devils Rivers, Goodenough Spring and Alamito, Terlingua, San Felipe and Pinto Creeks. A guaranteed annual quantity of 1,500,000 acre feet (1.9 km3) to be delivered in accordance with schedules formulated in advance by Mexico within specified limitations. Any other waters arriving at the Mexican points of diversion under certain understandings. To enable diversion of Mexico's allotted waters, the Treaty provided for the construction by Mexico of a main diversion structure in the Colorado River, below the point where the California–Baja California land boundary line intersects the river. It also provided for the construction at Mexico's expense of such works as may be needed in the United States to protect its lands from such floods and seepage as might result from the construction and operation of the diversion structure. In the 1944 Treaty, the two Governments agreed to give preferential attention to the solution of all border sanitation problems. This Treaty entrusts the International Boundary and Water Commission (IBWC) (the renamed International Boundary Commission of the 1889 Convention) with the application of its terms, the regulation and exercise of the rights and obligations which the two governments assumed thereunder, and the settlement of all disputes to which its observance and execution may give rise. The Treaty also provides that the IBWC study, investigate and report to the Governments on such hydroelectric facilities as the IBWC finds should be built at the international storage dams and on such flood control works, other than those specified in the Treaty, that the IBWC finds should be built on the boundary rivers, the estimated cost thereof, the part to be built by each government, and to be operated and maintained by each through its Section of the IBWC. Under the terms of the 1944 Treaty, the two Governments reached agreement for the solution of the international problem of the salinity of the Lower Colorado River (30 August 1973), and the IBWC submitted and the two Governments approved "Recommendations for the Solution of the Border Sanitation Problems" (24 September 1979). The Chamizal Convention of 29 August 1963 resolved the nearly 100-year-old boundary problem at El Paso and Ciudad Juárez. Known as the Chamizal Dispute, this involved some 630 acres (2.5 km2) of territory that were transferred from the south to the north bank of the Rio Grande by movement of the river during the latter part of the 19th century. By this Convention the two governments gave effect to a 1911 arbitration award under 1963 conditions. The Convention provided for the relocation by the IBWC of the 7 km (4.4 miles) of the channel of the Rio Grande so as to transfer a net amount of 176.92 hectares (437.18 acres) from the north to the south side of the river. U.S. President Lyndon Johnson met Mexican President Adolfo López Mateos in El Paso on 24 September 1964 to commemorate the ratification of the Chamizal Convention. The 1970 Boundary Treaty (23 November) resolved all pending boundary differences and provided for maintaining the Rio Grande and the Colorado River as the international boundary. The Rio Grande was reestablished as the boundary throughout its 2,019-km (1,254 mile) limitrophe section. The Treaty includes provisions for restoring and preserving the character of the Rio Grande as the international boundary where that character has been lost, to minimize changes in the channel, and to resolve problems of sovereignty that might arise due to future changes in the channel of the Rio Grande. It provides for procedures designed to avoid the loss of territory by either country incident to future changes in the river's course due to causes other than lateral movement, incident to eroding one of its banks and depositing alluvium on the opposite bank. This treaty, too, charged the IBWC with carrying out its provisions. In recent years, the IBWC has been criticized as an institutional anachronism, by-passed by modern social, environmental and political issues. The U.S. Section has been described as secretive, beholden to special interests, and indifferent to environmental problems. The State Department has attempted to distance itself from responsibility for the U.S. Section, even disclaiming jurisdiction, notwithstanding numerous statutes to the contrary. Critics, including the agency's employees, say poor leadership has led to deteriorating levees, dams and water treatment facilities. The IBWC addresses boundary and water issues. International delegations meet with the IBWC. The IBWC Commissioners speak at national and international water conferences. U.S.-Mexico border for a detailed treatment of the various conventions and treaties overseen by the IBWC. 1 2 3 4 "Treaties between the U.S. and Mexico". International Boundary and Water Commission. Retrieved 2015-06-12. 1 2 United States Department of State - Office of the Legal Adviser (2014). Treaties in Force. Government Printing Office. ISBN 9780160922930. ↑ International Boundary and Water Commission. "Minutes 144" (PDF). Retrieved 2015-06-12. ↑ International Boundary and Water Commission. "Minutes 158" (PDF). Retrieved 2015-06-12. ↑ Robert J. McCarthy, Executive Authority, Adaptive Treaty Interpretation, and the International Boundary and Water Commission, U.S.-Mexico, 14-2 U. Denv. Water L. Rev. 197 (Spring 2011). Also available for free download at http://papers.ssrn.com/sol3/papers.cfm?abstract_id=1839903. This article incorporates public domain material from the International Boundary and Water Commission document "Official site". Robert J. McCarthy, Executive Authority, Adaptive Treaty Interpretation, and the International Boundary and Water Commission, U.S.-Mexico, 14-2 U. Denv. Water L. Rev. 197(Spring 2011) (also available for free download at http://papers.ssrn.com/sol3/papers.cfm?abstract_id=1839903).